Tra-la-la! Our hero is now in technicolour. The first two epic stories, now bolder and brighter than ever before. 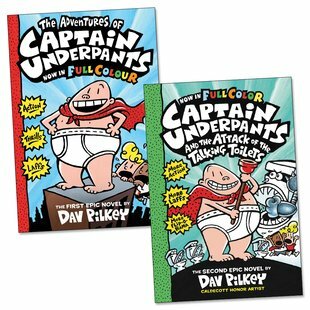 We’re going potty for these new editions with colour pics on every page. Whoopee! When naughty George and Harold hypnotise their headteacher, they create the greatest superhero in history. 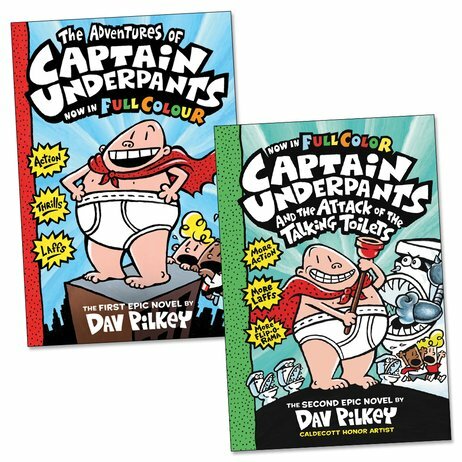 Captain Underpants has wedgie-power on his side, and he’s not afraid to use it. Naughty villains like diabolical Dr Diaper had better watch out: a waistband warrior’s about. The world’s ONLY superhero with massive white Y-fronts on. So there. 5 stars loved these books very funny and i like the coluor and the flip o ramas!